Greetings Yoga and T'ai Chi Students and Lovers of Breema and The Painting Journal! Many thanks to those who formed the 28 or more folks coming to the parole hearing at Riverbend Prison, March 18th in support of Mack Cole. It was inspiring to see several former inmates return for this hearing filled with vitality, good health and well-being that radiated through the gathering. Mack was able to visit before and after the hearing with those there, and he was beaming. Not all ran as planned, as the shortage of help only allowed 8 folks into the small hearing room. Those who spoke on behalf of Mack seemed to eventually soften the communication of the person on screen directing the hearing. Mack got the four votes he needed to take the next step. For now he heads toward the final “to do' list before the final hearing. Do keep the good vibes flowing! There is now a possibility for Yoga students in Nashville to attend a Yoga Class at RMSI. (This includes those who meditate without doing asana, who can come and sit.) This has happened in the past, and for many months been on hold. If you would like to join in taking a yoga class on some Wednesday (2:15-3:45pm) please do the following. I will be compiling this list that will be sent to the warden. I would like to have all who are interested on the list by April 15. Please get your name to me ASAP so you can come to a class. When we get approval from the warden, I will contact persons on the list to see what day they could come. At that time you will get further information on details. I am excited about his happening, and welcome you coming…….and do remember….things move slowly on prison time! Full Pink Moon is Friday April 19. Restorative Yoga will be the week of April 15. Please bring a bolster if you have one. T'ai Chi classes continue Tuesday and Thursday mornings and are open to newcomers. World TaiChi and QiGong Day will be taking place 10-12 on Saturday April 27 at Dragon Park. This event is free and open to the public. All Tai Chi and Yoga students are invited to come and move in these life-giving forms, joining this lively annual event which the Jen-Jen from the Chinese Alliance has been offering to the Nashville community for many years! Look for T'ai Chi with Julie Russell a teaching DVD started over 25 years ago with several folks but never finished. Kirsten Damphier filmed the forms last fall, and Elizabeth Holden in 2000. It is presently being edited by my brother Sam Russell in New Jersey. Judy Caldwell is computer assistant. Will get the word out when it is available! 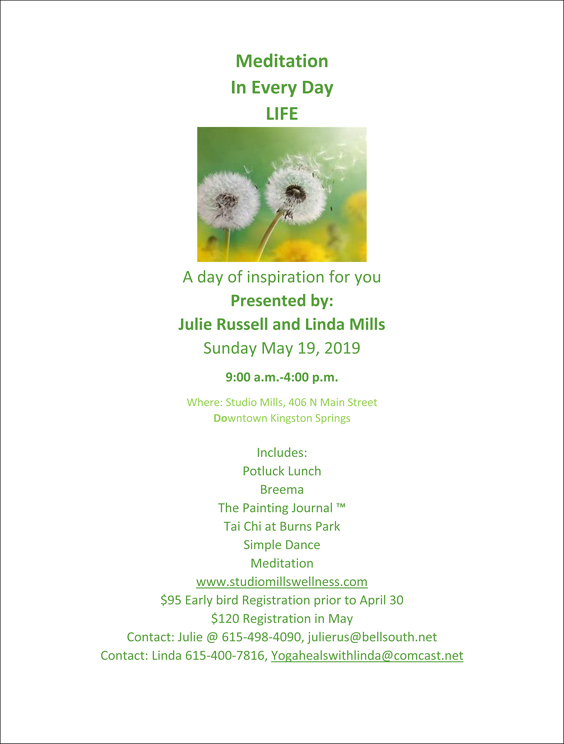 Meditation in Everyday Life is offered Sunday May 19 (9:30-4:30) with Linda Mills and Julie Russell at Studio Mills in Kingston Springs TN. We will be expanding our experience of meditation through movement, stillness and simple painting. Flyer coming out soon! Circle Dancing is taking place this Friday April 5th and Friday April 19 at Friends Meeting House at 503 26th Avenue S., 7-9pm. Several folks eat a bite at Calypso Cafe on Charlotte Ave. after 5:30. All are welcome! April brings this full blooming of Spring, sometimes blustery, and also many offerings to experience in the Nashville community. May your days be full and balanced in this abundance! Breathe well…………!